VTT. 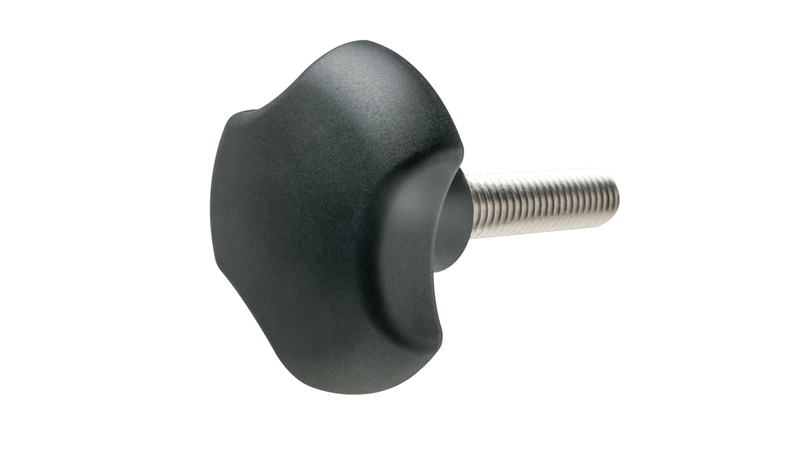 Three-lobe knobs in polyamide based technopolymer are available in black or white similar to RAL 9002 (CLEAN LINE) with matte finish. The new design with three ample lobes is particularly ergonomic and contributes to deliver a better transmission of power even with smaller diameters, allowing the operator to achieve higher torques. The three-lobe knobs are available in diameters 25, 32, 40 and 50 mm in two executions (from M5 to M10). The compact shape, free of any recesses, prevents unhealthy residues from depositing and combined with the AISI 304 stainless steel inserts not only ensures easy cleaning but makes these clamping knobs particularly suitable for all those applications on machines and equipment that need corrosion resistant materials and are subject to complete cleaning cycles, as in the food, medical and pharmaceutical industries.